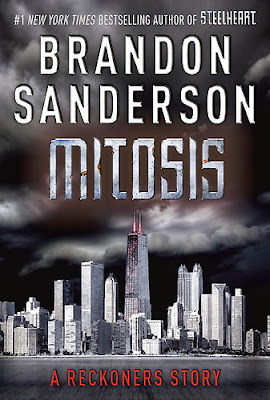 You can now download a brand new Brandon Sanderson novella, Mitosis, for only 1.99$ here! From New York Times bestselling author Brandon Sanderson’s action-packed novel Steelheart comes Mitosis, a short story set in the world of The Reckoners series, exclusively available in the digital format. Epics still plague Newcago, but David and the Reckoners have vowed to fight back. Catch all the action before, Firefight, the exciting sequel to Steelheart, hits shelves in fall 2014.